August 18 2016. Below is a summary of many of the important road races in the first quarter of 2016. Much of this material has already appeared, under my byline, in National Masters News but the editors have indicated I am free to include the material in my blog posts as well. Local and Regional Elite runners often participate in these road races, in part hoping to have the chance to compete against the National level Open and Masters Elites who travel to these visible races. This report will include the Chevron Houston Marathon, the Kaiser Permanente San Francisco Half Marathon; the Gasparilla Half Marathon; the Gate River Run; the United Airlines New York City Half Marathon; and the Crescent City Classic 10K. The next report will cover April through June. Because this is already quite long, I will include a second separate posting on races from April through June. 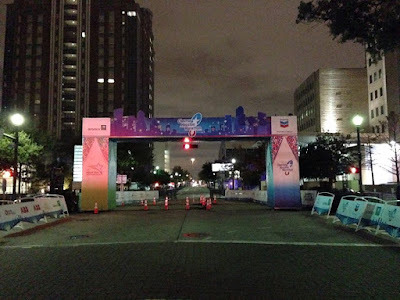 The CHEVRON HOUSTON MARATHON, a fixture in US long distance running since 1972, especially for the winter months, was held on January 17th this year, along with the Aramco Half Marathon. 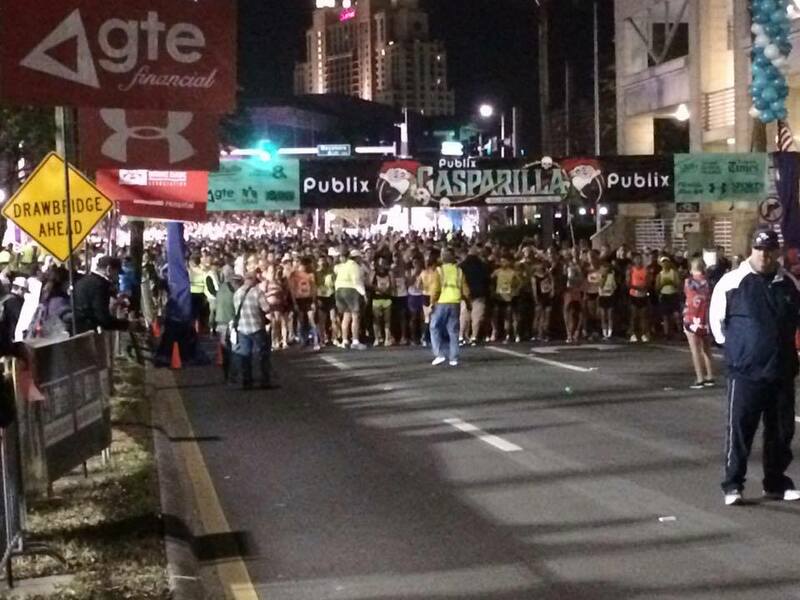 Both races start at 7 am with the half marathon group breaking off from the Marathon course between miles 7 and 8. The course is quite flat but the Marathon (Half Marathon) has a substantial hill between miles 24 and 25 (11 and 12). 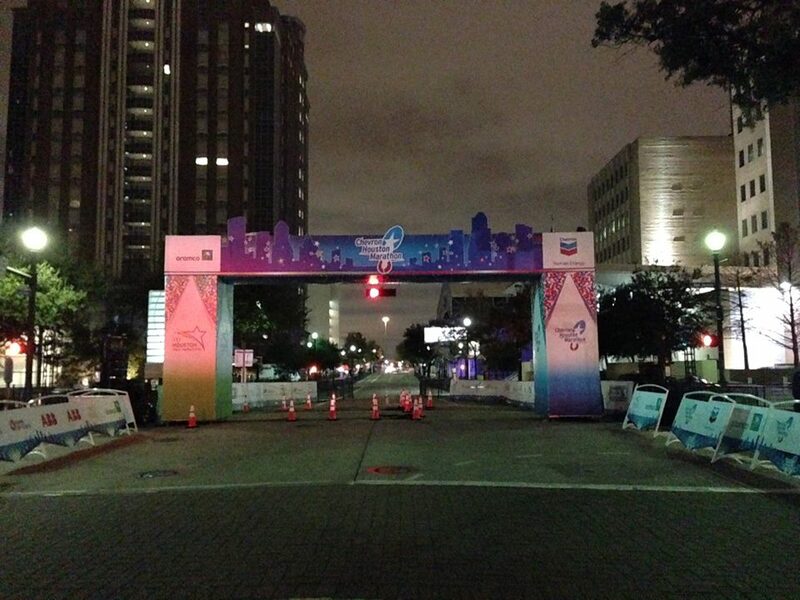 The Houston Marathon has hosted the Olympic Trials and the Aramco Half Marathon has been a frequent stop on the USATF Running Circuit. The weather on the 17th was colder than usual with temperatures in the upper 30’s at race time, rising to the lower to mid 40’s by the end of the Marathon. Double-digit winds overnight calmed to moderate by race time and remained so. Men. The fastest Masters time was recorded by Michigan’s Clint Verran, 40, who ran with an Elite number. His strategy must have been to stick with the 2nd or 3rd elite pack as long as he could. He hit the first 5K in 16:34 and was 33:12 at 10K. After that torrid 5:20 per mile pace he slowed to 5:34 pace by the 3rd 5K and then 5:40. He settled at 5:45 pace for the second half of the Marathon, kicking it in at the end to finish in 2:26:43, an overall pace of about 5:36 per mile-phew! Apart from Verran, the Men’s Marathon was a Southwestern affair with Jason Butler, 43, coming down from Oklahoma and Brandon Wingate, 41, coming over from Louisiana to battle Texan Michael DeFee, 41, for the honor of being the first non-Elite Masters* runner across the line. DeFee took the early lead, hitting the 5K in 17:57 with Butler and Wingate biding their time 10 to 15 seconds back. It was Butler’s turn to surge next as he took a 20 second lead by the 10K mark over Wingate who had slipped past DeFee into 2nd. By the time they ran past the halfway point, Butler had 1:08 on Wingate, with DeFee 5 seconds further back. After slowing slightly after the half, Wingate gradually upped his tempo, dropping below 5:50 per mile as he cut Butler’s lead to 42 seconds by the 30K mark, in turn, dropping DeFee who was now 40 seconds back, unable to match the acceleration. Over the next 5K Wingate kicked it up another notch with a 5:37 per mile pace and that left Butler 18 seconds back. Wingate stretched it out from there, beating Butler by almost 2 minutes in 2:31:00. Butler never really faded, keeping to a sub-6 pace per mile (except for the hilly 5K) to finish in 2nd in 2:33:04 with DeFee 2 minutes further back in 2:35:07. In addition to Wells [86.2%], Butler [84.5], Wingate [84.2] and McFee [82.1], other runners with National Class performances [age grade at 80% or above] included Louisiana’s Michael Iverson, 49, who won the M45 group in 2:43:03 [83.4], Virginia’s John Hartin, 58, who won M55 in 2:59:10 [82.3], Michigan’s Rich Power, 51, who took the M50 crown in 2:49:49 [81.5], Texan Steve Chase, 47, who finished 3rd in M45 [81,2], and California’s Tony Torres, 46, who took 2nd in M45 [80.6]. The oldest athletes to win age group medals were Bill Dodson (CA), Jim Braden (TX) and Dan Shuff (TX), all listed as 80, who took 1st, 2nd and 3rd in that order in M80. Marathon. Women. Unlike the Men, there were no Masters Women running with the Open Elite Marathoners. In terms of the Masters field, it was East Coast versus West Coast, with California’s Caroline Boiler, 41, toeing the line against Pennsylvania’s Brenda Hodge, 44, and Mindy Sawtelle-Zottola, 43. Hodge ran a fine, well-paced race to take 3rd away from Texas’s Donna Mills-Honarva who set a faster pace over the first 15 K but ran into trouble a bit before the halfway mark where Hodge started to close and then chipped away at her lead by 10-15 seconds per mile, passing her at 30K and never looking back. It is a tribute to Mills-Honarva’s grit that she kept it going to finish 4th in under 3 hours. Hodge took 3rd in 2:56:22. Sawtelle-Zottola was able to keep Boiler in sight for the first 15K which Boiler hit in 57:59 with Sawtelle-Zottola only 15 seconds back. Boiler hit the accelerator to drop her pace to 6:14 per mile at the same time that Sawtelle-Zottola found she could no longer maintain a sub 6:20 pace. Boiler passed the halfway mark in 1:21:36 with a minute gap back to her rival and then stretched it from there to take the win in 2:44:21. Sawtelle-Zottola ran her own race over the 2nd half of the race, maintaining a pace well under 7 minutes per mile to claim silver in 2:52:25. In addition to the national class performances of Boiler [85.5], Sawtelle-Zottola [82.8] and Hodge [81.6], Pennsylvania’s Nancy Smith, 59, who took 3rd in W55 in 3:30:34 [82.4], and Texans Laura Bennett, 48, who won W45 in 3:03:59 [81.6] and Lynn Malloy, 55, who won W55 in 3:23:57 [80.5] enjoyed national class race performances. The oldest women to win medals were 72 year old Texans, Sally Sims and Ute Eisele who finished the race only 14 seconds apart in 5:08:58 and 5:09:12. Men. No serious competitors ran with Elite numbers in the Men’s Half Marathon. California’s Neville Davey, 40, fresh off a strong performance at the USATF Club Cross Country Championships in San Francisco the month before, blasted away from the starting line and left no doubt who was the fastest Masters Runner in this race. Texans Luis Armenteros, 43, and James Jackson, 49, had no answer when Davey sped past the 5K mark in 15:13 with nearly a 90 second lead. Davey stretched the lead throughout the race, taking first in 1:07:41. Armenteros went out faster than Jackson, building his lead to almost a minute by the 10K, crossing the line in 33:19 to Jackson’s 34:13. Jackson gradually chipped away at the lead, lowering it to 47 seconds by the 15K and only 20 seconds by the 20K. But Armenteros maintained a good pace over the last kilometer to claim 2nd in 1:12:21 as Jackson ran out of race course and had to settle for a fine 3rd place finish in 1:12:36. Jackson [89.0], Davey [88.7] and Amenteros [81.3] all had National Class performances; they were joined by Ilinois’s Robert Held, 58, who won M55 in 1:24:31 [82.8] and Texan, Mark Newcomb, 59 who finished 2nd to Held in 1:27:03 [81.2]. The oldest man to win a medal was 83 year old Texan, Ray Boytim, whose 2:56:15 netted him 2nd in the M80 age group to 80 year old Pete Alberts. Women. As with the Men, the fastest Women’s times were turned in by two who ran with the Elites, 41 year old Jen Rhines and 51 year old Colleen DeReuck. Rhines took 19th overall and DeReuck 23rd. Joanne Zeiger, 45, also ran, but was battling injuries during this time and was clearly off her norm. DeReuck ran a great race, hitting her 5K marks in 18:21, 36:28, maintaining a sub 6 minute mile pace the rest of the way, finishing in 1:17:25 for a 5:54/mile overall pace. Rhines, a decade her junior, ran even faster, hitting her first two splits in 17:01 and 34:07 and racing across the finish line in 1:14:57 for the fastest masters time of the day. Apart from Elites, Rhines and DeReuck, it was Perry Shoemaker all the way as she covered the first 5K in 17:38, creating a 3 minute gap on the field. She stretched her lead all the way to the finish to defeat all other rivals by over ten minutes. But Michigan’s Nicole Derrick and Texas’s Kirsten Stefan had a dandy race to be the best of the rest. Stefan went out hard, enjoying a lead of 18 seconds at the 5K and 16 seconds at the 10K with a time of 41:34. But then she paid the price as Derrick caught her and passed in the 3rd 5K segment. Derrick held the lead to the end, enjoying a 1:28:28 to Steffan’s 1:28:51. DeReuck turned in a world class performance at 96.2% as did Rhines [90.6], no surprise there. But Shoemaker [90.1] also turned in a World Class performance-Impressive to say the least! National Class performances were turned in by Oklahoma’s Terri Cassel, 54, who took the W50 crown in 1:29:08 [87.4], four Texans Anne Erickson ,73, who won W70 in 1:58:51 [86.0], Debbie Clark, 63, who won w60 in 1:46:49 [82.2], Colleen Rademacher , 57, who captured the W55 title in 1:39:19 [81.5], and Theresa Pearsall, 63, who finished 2nd to Clark in W60 in 1:47:49 [81.4]. The oldest woman to win a medal was Texan, Marsha Smith, 80, who took the W80+ crown in 2:59:46. 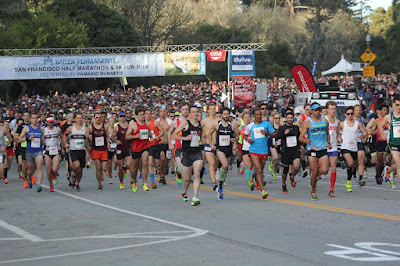 The KAISER PERMANENTE SAN FRANCISCO HALF MARATHON is the kickoff long distance running event for the West Coast, held on February 5th this year, its 33rd annual running. Although it draws mostly California runners, there are often some pretty fast times for Masters Runners. It was classic weather with temps in the upper 40’s to lower 50’s with little wind and no precipitation, almost perfect for racing. Men. The overall race was a battle between a newcomer to the Masters ranks, Brad Sloan, 40, from Oakland and two veterans, 50 year old Darrin Banks of Berkeley and 51 year old Albert Boyce of San Francisco. Youth had its day as Sloan cranked out a win in 1:15:48, with Banks 44 seconds back in 1:16:32 and Boyce a minute and a half further back. But you can bet those two 50 plus runners smoked a lot of younger runners! Banks [85.1} and Boyce [84.0] turned in National Class performances and were joined in that by Menlo Park’s John Hale, 58, the M55 winner in 1:22:41[84.7], San Francisco’s John Hirschberger, 64, and Doug Steedman, 60, who finished 3rd and 1st respectively in M60 with times of 1:33:50 [82.5] and 1:27:09 [81.9], Berkeley’s Michael Axinn, 55, who finished 2nd to Hale in 1:22:48 [82.3], San Bruno’s Paul Ghidossi, 50, finishing 3rd to Banks and Boyce in M50 in 1:20:54 [80.5], and Michael Ward, 61, of San Francisco CA, who took 2nd in M60 in 1:29:57 [80.1]. The oldest medal winner was 83 year old Henry Nebeling of San Francisco, who won the M80+ group in 2:56:13. Women. It was also a battle of young vs. old but this time the older competitor won, with Santa Rosa’s Jacqueline Komrij, 51, taking the title in 1:24:47, 27 seconds ahead of Stephanie MacKenzie, 40, out of Los Altos Hills. MacKenzie’s 1:25:14 was sufficient to claim 2nd by 18 seconds over another newcomer to the Master’s Ranks, Liz Gottlieb, 40, who took 3rd in 1:25:32. Komrij had the top age grade [88.5] so she certainly had the best all-around performance. Others with National Class performances included Larkspur’s Lisbet Sunshine, 52, who took 2nd to Komrij in W50 in 1:27:40 [86.7], Santa Cruz’s Katherine Beiers, 83, who captured the W80+ crown in 2:33:33 [83.5], San Jose’s Shelly Sumner, 61, who won W60 in 1:44:59 [81.3], Carrie Dion, 62, of Los Gatos, 2nd to Sumner in 1:46:53 [81.0], and two San Franciscans, Lorna Thompson, 50, 3rd in W50 in 1:31:51 [80.7], and Genevieve Segol, 69, who took the W65 title in 1:59:50 [80.0]. The oldest woman to win a medal, Katherine Beiers, not only took the W80+ age group medal, she had the 3rd highest Age Grade score. Wow! 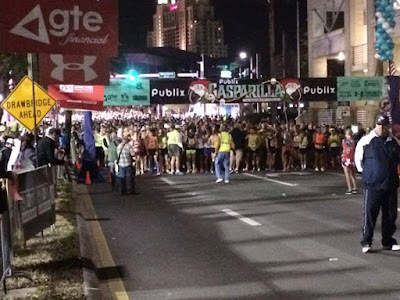 GASPARILLA HALF MARATHON---Tampa FL—Feb 21 2016—Run since Feb 1978, the Half Marathon starts at 6 am just in case the day should be unseasonably warm. In fact the day was perfect, clear and calm with temperatures in the upper 50’s for the first 2 hours of the race. But the high humidity may have affected some runners. Men. Two 46 year old Floridians, Joshua Rayman and Tom Russell, tried to hold off a northern invader, 51 year old Eric Stuber, from Lansing Michigan. All 3 raced conservatively, achieving negative splits. At the halfway mark it was Rayman at 38:41, Stuber nearly a minute back at 39:35, with Russell a further minute back. And that’s the way it stayed to the end with Rayman bringing it home in 37:52 for a handsome 16:33 win. Stuber’s 39:18 over the last 6.55 miles earned him the silver medal in 1:18:53. Russell closed a bit on Stuber over the last half of the race but ran out of race course, finishing 3rd in 1:19:16. Stuber had the top age graded performance at 84.1 with Rayman 2nd at 82.1. National Class performances were also turned in by Tampa’s Jeffrey Lessie who won the M55 crown in 1:23:25 [81.7], and the M65 winner, Gerald Marsh, 65, of Pittsburgh PA in 1:31:48 [81.6]. The oldest men to win medals were the 81 year olds who took 1st and 2nd in M80+, Wayne Hinaman of Cincinnatti Ohio in 3:04:59 and a local hero, Charles Walker, of Tampa in 3:18:57. Women. The Overall Masters winner was Tampa’s own Terri Rejimbal. Three years ago, at the age of 44, she became the oldest runner to capture the Open title. Now, at 47, she finished 3rd in the Open race but captured the Masters title, although pushed by 41 year old Michelle Nunez of Orlando Florida. Rejimbal is very familiar with the course and tends to go out fast as she knows the sun can slow runners down once it gets up on a warm day. She ran the first half in 41:58, opening up a 1:15 lead over Nunez. Nunez ran a good negative split but was only able to take 45 seconds out of Rejimbal’s lead over the second half of the race. In the end Rejimbal had the gold in 1:24:28 with Nunez bagging the silver in 1:25:12. Julie Hannah, 42, of Melbourne FL captured the bronze in 1:30:20. Rejimbal [84.8] and Nunez [83.6] had the best age-grading scores. National Class performances were also turned in by the 1-2 finishers of W60, Amy Yanni, 61 of Ft. Myers FL in 1:42:49 [83.0] and Jacksonville’s Leslie Hague, 62, in 1:45:08 [82.3]. 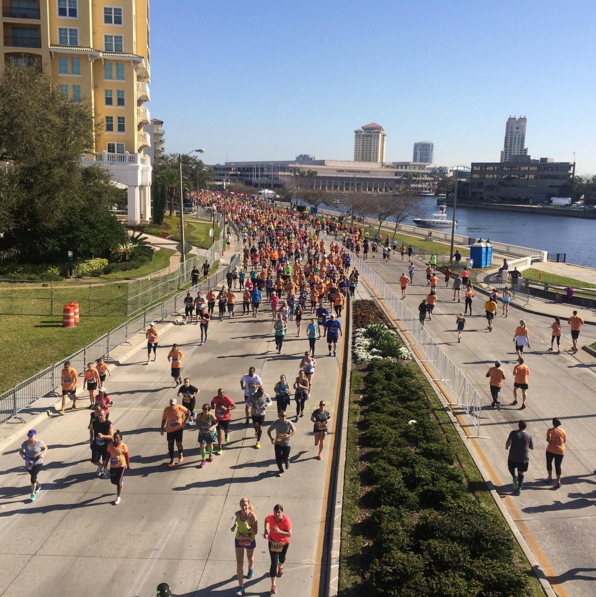 Tampa’s Gail Norman, 57, and Iowa City, Iowa’s Mandi Kowal, 52 also recorded National Class age grades in winning their respective divisions in 1:39:33 [81.3] and 1:34:02 [80.8]. The oldest woman to win a medal was Tampa’s Ellen Stichter, 81, who took the W80+ gold in 3:37:03. GATE RIVER RUN 15K—Jacksonville FL--39th Annual—March 12 2016—This Florida race starts at 8:30 am, and runners were warned it would be another hot one, the second year in a row. It was 68 degrees at the start of the race, with temperatures rising into the 70’s by the time the Open Elite runners were hitting the Hart Bridge, seven and a half miles into the race. The humidity was in the 90’s for the first part of the race with humidity moderating somewhat as temperatures climb. At least it was overcast and, to be honest, in 2015 it was several degrees hotter. The course is relatively flat except for the climb up the Hart Bridge between miles 7 and 8.3; that climb is significant. Men. The fastest Masters Men were listed with the Open Elites, not in the Age Group results. Paul Thompson, 50, of Peekskill NY just aged up to the M50 group but showed he could still run with the best as he topped two fine M40 runners, Alan Black, 42 of Hillsboro Georgia and the Atlanta Track Club, and Jacksonville’s Marc Burget, also 42. Thompson covered the first 5K in a scorching 16:30, leaving Black a half minute back and Burget another half minute back from Black. Thompson slowed a bit after that first burst but continued to build his lead throughout, winning in 50:46, with nearly a 2 minute gap back to Black who took 2nd in 52:33. Burget closed the gap by a half minute in the last 5K to finish 18 seconds back of Black in 52:51. Thompson recorded a World Class time [90.3], and Black [81.6] and Burget [81.2] both recorded National Class times. They were joined by 66 year old Page Ramezani, of Jacksonville, who took M65 gold in 1:02:00 [85.7]. Others achieving the National Class standard included Floridians Robert Hendrick, 73, of Deerfield Beach who won M70 in 1:07:47 [84.7], Ponte Vedra Beach’s Brad Smith, 46, who took M46 gold in 54:05 [81.9], Herbert Weber, 65, of Miami Lakes who finished 2nd in M60 in 1:03:33 [82.7], Fleming Island’s Jim Metzger, 53, who took silver in M50 in 57:25 [81.9], Melbourne Beach’s Gary Gates, 51, who captured the M50 gold medal in 56:36 [81.7], and St. Augustine’s Bill Phillips, 61, who took the M60 gold in 1:02:18 [81.2], St. Petersburg’s Al Weiringa, 69, 3rd in M65 in 1:07:33 [81.0], Tampa’s Larry Smart, 46, silver in M45 in 55:04 [80.5], and Steve Chin, 47, of Satellite Beach, 3rd in M45 in 55:45 [80.1]. Paul Carlin [your reporter] made a road trip from Indianapolis IN to take the M70 silver medal in 1:08:30 [80.7]. The oldest man to win a medal was 86 year old August Leone of Boca Raton FL who claimed the M80+ silver medal in 2:04:37. That’s some running at age 86! 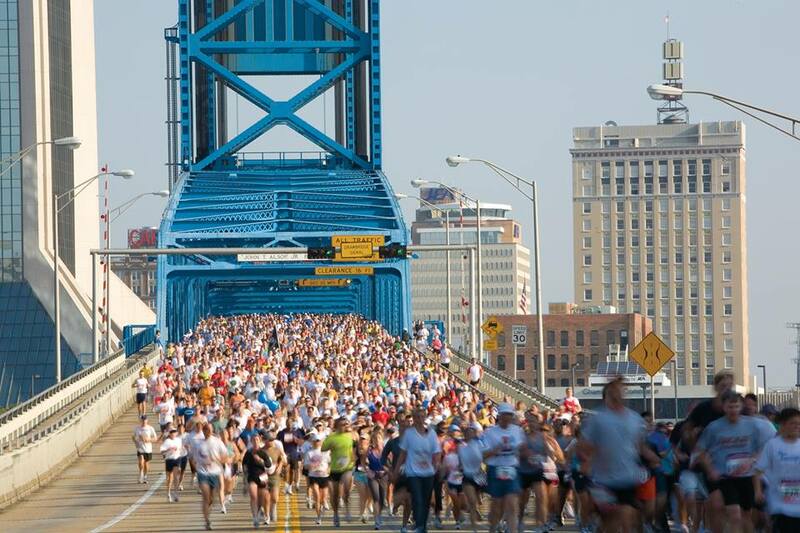 The signature landmark of the Gate River Run is the Hart Bridge looming toward the end of the race. Runners crest the bridge with about 1600 meters to go and it is all downhill and then flat to the finish. So they make a special deal out of who goes fastest for the last mile. This year it broke down this way: Overall Masters Thompson 5:04.4 M40 Patrick Gallagher Gainesville FL 5:44.1 M45 Chin 5:24.8 M50 Gary Gates Melbourne Beach FL 5:25.6 M55 Walter Sieg Palm Harbor FL 5:59.7 M60 Phillips 6:25.6 M65 Ramezani 6:05.6 M70 Carlin 6:44.1 M75 Jim Cave Savannah GA 9:16.3 M80 August Leone, 86, Boca Raton FL 25:47.7. Women. As with the Men, the top Masters Women ran with Elite numbers and showed they deserved them. Two Floridians, Kim Pawelek-Brantley, 42, St. Augustine, and Michelle Kruger, 40, Jacksonville, went up against Christy Peterson, 41, North Wales PA. At the 5K mark it was Pawelek-Brantley at 19:28 in the lead with Krueger tracking her closely but Peterson hanging back a few strides, crossing the mat in 19:35. Pawelek-Brantley stretched her lead considerably over the 2nd 5K, which she hit in 39 flat, opening up a 35 second lead over Krueger, with Peterson now 12 seconds back from Krueger in 39:47. Pawelek-Brantley had it all the way as she stretched her lead out a little further over the 3rd 5K to win the race in 58:28. It looked like It might be 1-2 for Florida but Pennsylvania’s Peterson had a different idea. She surged past Krueger on the run up the Hart Bridge and kicked into high gear on her way down, turning in the fastest Masters last mile of the day as she claimed 2nd in 59:34. Krueger toughed it out though, turning in a 1:00:41 for the bronze medal position. Pawelek-Brantley [82.4] and Peterson 80.3] both recorded National Class times. They were joined in that class by Leslie Hague, 62, Jacksonville FL, who won the W60 group in 1:14:15 [82.1], Deanna Medvidofsky, 54, St. Johns FL, who captured the W50 gold medal in 1:07:39 [81.1], and Karen Stelhorn, 49, St. Johns FL, who took the top prize in W45 with a 1:04:29 [80.0]. Eighty-seven year old Haley Olson, Jacksonville FL, was the oldest runner to capture a medal as she won the 80+ group in 2:14:22, an amazing achievement! 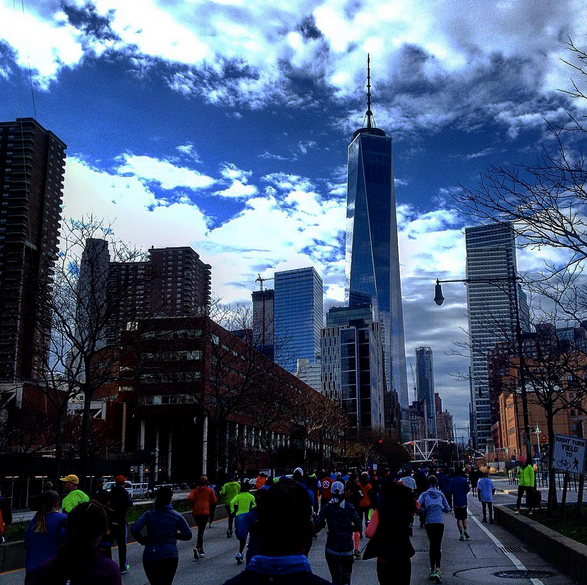 The course is entirely in Manhattan, commencing in Central Park and ending at Wall Street in downtown Manhattan. There is a slight drop in elevation overall, perhaps 50 feet or so, but there are challenging hills in Central Park. It typically attracts an impressive field of Open Elite runners. The temperature at the start of the race was just above freezing with cloudy skies and a brisk wind which got up into the mid-teens after 8 am, with occasional gusts up to 20 mph. Men. Clint Wells, 40, dropped down from the Boulder Colorado altitude to take on New York’s best. Wells took the USATF Masters marathon Championship last October at the Twin Cities Marathon and showed that his fitness had wintered well. Hitting the first 5K split in 16:02 (yes, you read that correctly! ), Wells had already put a minute and 40 seconds between him and his closest pursuers, 40 year old Dan Gray, New York City, and Brooklyn’s Troy Squire, 41. Wells built his lead steadily throughout the race, winning by more than 6 minutes in 1:06:47. Gay and Squire wisely let Wells go and duked it out for silver and bronze. Gay tracked about 6 seconds back from Squire who cruised through the first 5K in 17:36 and the 10K in 35:15. Then Gay made his move, throwing in a 17:07 5K split. Squire lowered his 5K split to 17:20 but it wasn’t enough to match Gay who took a 6 second lead at the 15K in 52:29. Despite Squire’s best efforts, Gay was able to build the lead from there, claiming the silver medal in 1:13:23 with Squire nailing the bronze in 1:13:43. At an 89.9% age-grade, Wells was within a tick of a World Class performance. Squire [82.0] and Gay [81.8] also clocked in with National Class times. Other excellent National Class times were turned in by: John Sullivan, 55, West Roxbury MA who raced to M55 gold in 1:19:43 [85.4]; Brad Kelley, 50, Jackson Heights NY, who took first in M50 in 1:16:51 [84.8]; Jim Price 58 Moorestown NJ, who was the 2nd American across the line in M55 in 1:22:36 [84.8]; Daniel Lillyman, 58, Mahomet IL, who followed Price across the line in 1:23:32 [84.6]; David Atkinson, 46, Grand Blanc MI, who took the M45 crown in 1:16:49 [82.0]; Rob Zand, 46, NY NY, who was nipped for the gold medal by a mere second by Atkinson in M45, in 1:16:50 [82.0]. The M55 group was loaded this year with 5 more National Class times: Alan Ruben, 59, NY NY, 1:26:46 [81.5]; Frank Drury, 55, NY NY, 1:24:20 [80.8]; John Hale, 58, Menlo Park CA, 1:26:48 [80.7]; Gary Leaman, 56, Hardwick NJ, 1:25:19 [80.6]; and Donald Favre, 57, NY NY, 1:26:32 [80.2]. And the M45’s and M50’s had another bunch too who achieved National Class status, along with a couple of M40’s; Timothy Stockert, 49, NY NY, 1:20.0 [80.8]; James Lefrak, 42, NY NY, 1:15:30 [80.7]; Richard Nelson, 45, NY NY, 1:17:32 [80.6]; Alexandre Tilmant, 46, NY NY, 1:17:47 [80.3]; Billy Barone, 51, New Haven CT, 1:21:58 [80.2]; Guillermo Pineda Morales, 43, Ridgewood NY, 1:16:37 [80.2]; Tim Bradley, 54, Long Beach NY, 1:24:16 [80.1]; and Jesus Pinero, 49, San Juan PR, 1:20:43 [80.0]. The oldest gentleman to win a medal was 83 year old Joseph Pascarella of Brooklyn NY, who took the silver medal in the 80+ division in 3:22:56. Women. Janet Collar, 44, of Spokane Washington flew coast to coast to take on two fleet New York City runners, Carolina Pena, 42, and Locky Trachsel, 47. Collar went out fast, hitting the 5K mark in 19:36 and the 10K in 38:54. Trachsel was able to keep her close for the first 5K, where she trailed by 6 seconds but by the 10K timing mat, she was 17 seconds behind Collar. From there Collar built the lead up to a minute at the 15K with a time of 57:28 and then stretched it to 90 seconds within the next 5K. In the end Collar had a handsome win in 1:20:53, with Trachsel 2nd in 1:22:26. Pena ran well but never really got into the mix, trailing Trachsel by 19 seconds at the 5K, with the gap up to 2nd growing to 46 seconds at the 10K. and a minute by the 15K where it stayed until the end. Pena’s bronze medal time was 1:23:26. Collar’s time was National Class, age-grading at 86.0. Trochsel, despite her 2nd place finish to Collar actually had a higher age-grade at 86.9. Pena was not that far back but her relative youth worked against her as her score was 82.0. Some really excellent age-graded performances came out of the Age group winners. Erika Campbell, 66, Ridgewood NJ, took W65 gold in 1:42:38, age-grading close to World Class at 89.3. Sharon Vos, 61, Old Greenwich CT , the winner of the W60 group in 1:36:50 was just a tick back in age Grading at 88.2. The other top performance was turned in by Jane Lundy, 55, Yonkers NY, whose 1:29:32 netted her the gold medal in W55 for an 88.1%. Other strong National Class performances were turned in by Fiona Bayly, 48, NY NY, who finished 4th overall and 2nd to Trachsel in W45in 1:23:55 [86.3]; and the top 2 runners in W50, Heather Knight Pech, 54, Darien CT, the gold medalist in 1:30:13 [86.3]; and Jean Norton, 53, Wurtsboro NY, the silver medalist in 1:30:15 [85.2]. Further National Class times were turned in by the W70 winner, Yong Smailes, 70, Huntington WV in 1:56:33 [83.6]; W40’s Cathrine Wolden, 44, Pound Ridge NY, 1:25:29 [81.3]; as well as W45’s bronze medalist, Mary Pardi, 46, Falmouth ME, 1:28:09 [80.4], and the two women who followed her across the line, in her division, Julie McElroy, 49, Sleepy Hollow NY, 1:29:12 [82.2] and Liz Herbert, 47, Darien CT, 1:29:25 [80.1]. The W50 contestants who followed Pech and Norton across the line and achieved National Class status included bronze medalist Christine Morgenroth, 51, NY NY, 1:30:52 [82.6] and Laurajean Molon, 51, Sparta NJ, 1:33:33 [80.2]. National Class performances among W55 Runners included Ellen Bushman, 59, NY NY, 1:40:15 [82.9]; Dolores Doman, 59, Dix Hills NY, 1:42:51 [80.8]; and Gloria Huberman, 58, Fair Lawn NJ ,1:42:29 [80.0]. National Class W60 Runners who trailed Vos across the line included Leslie Cohen, 60, Santa Monica CA, 1:40:06 [84.1]; Bette Clark, 60, Yonkers NY, 1:41:39 [82.9]; Ida Draim, 60, Alexandria VA, 1:41:47 [82.7]. The oldest woman to win a medal was Ginette Bedard, 82, of Howard Beach NY who took the W80+ gold medal in 2:39:28. 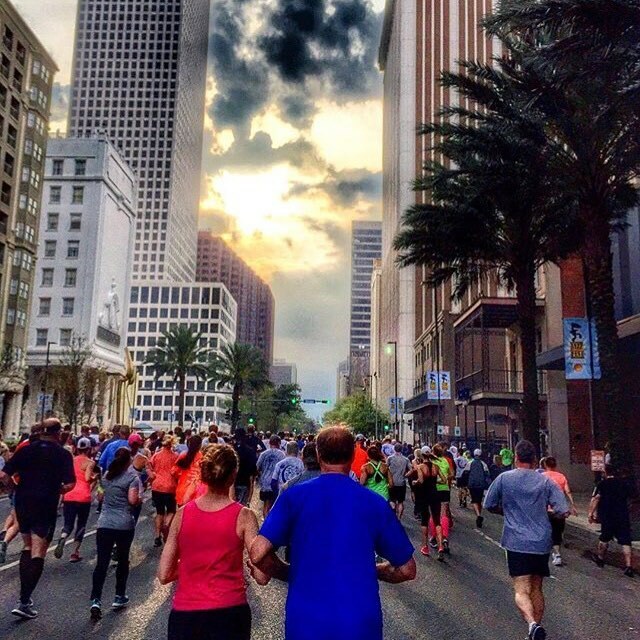 The 37th running of the Crescent City Classic was held, as usual, on the Saturday between Good Friday and Easter with some of the best weather New Orleans has to offer. Temperatures were in the low 60’s, the sky was overcast and winds were light to moderate at 5 to 9 mph. This race, unlike some of the others was pretty cut and dry. Wingate covered the first mile in 5:16 with Iverson 20 seconds back and Cooper another 14 seconds behind. Wingate crossed the 5K mat at 16:13 with Iverson a minute back and Cooper nearly a half minute behind him. Wingate stretched it out from there and the gap between Iverson and Cooper grew very slightly. Wingate took gold in 32:34, with Iverson in 2nd place, 34:58 and Cooper claiming bronze in 35:32. Wingate [85.8] and Iverson [85.2] turned in strong National Class performances but two Age Group winners did them one better and turned in World Class performances. Ninety-six year old, Gregory Roderts, of Gretna LA finished 6th in the 80+ division in 1:25:22, which age grades at an amazing 104.57! That was, in essence, a World’s Best performance or very close to it. Jeffery Dundas, 57, of Conyers GA, the Atlanta Track Club, and a regular on the USATF Masters Grand Prix circuit, singed the streets of New Orleans with a 35:27, good for M55 silver and a 90.05 age grade score. In addition to Wingate and Iverson, strong national Class performances were also turned in by Kerry Barnett, 55, of Keego Harbor MI who needed it to edge Dundas for the M55 win in 35:03 [89.5]; Phil Jones, 60, Metairie LA, who took the M60 gold in 36:58 [88.7] and Peter Mullin 65, Houston TX, another mainstay on the USATF Masters Circuit, who captured the M65 gold medal in 39:19 [87.4]. Byron Adams II, 52, New Orleans, finished first in M50 in 37:20 [81.9] and was joined by fellow National Class runners, Leonard Vergunst, 60, Ocean Springs MS and Chris Neal, 62 Milton FL, who followed Phil Jones across the line in M60 in 38:53 [84.4] and 40:07 [83.3] respectively. 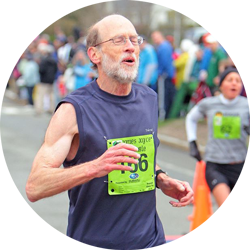 Paul Giannobile, 56, Minnetonka MN, must have been surprised to run a very strong 37:31 [84.3] and only finish 3rd in M55, a tribute to the loaded field in this race. As the reader might have guessed, 96-year old Gregory Roderts was the oldest finisher. He did not win a medal but to finish 6th out of 18 80+ entrants is no small feat at the age of 96, and is commemorated by his World Class Age Grading score. The oldest men to win medals were the 3 medal winners in that age group, all 82: Jerry Prentice Braunfels TX 1:06:09; Ed Dugas, Sr. Lafayette LA 1:14:43; and Phil Bohan Foley AL 1:16:20. Jen Rhines came down to New Orleans from Boston to prep for her Spring racing season and have a good tune-up before the Carlsbad 5000. She was not disappointed, nor were the fans, as she was 3rd overall and the first American woman across the finish line in 33:21. She hit the first mile in 5:14 and the 5K in 16:23 on her way to the win—amazing! The other Masters Runners in contention let Rhines and the other Elite runners go, and focused on their own race for 2nd across the line and it was a dandy. Michelle Williams, 43, of Pensacola Florida went up against Gigi Vanlangendonk, 42, of Metairie LA. Williams took it out fast, hitting the mile mark in 6:45 with Vanlangendonk tracking her 5 seconds back. Vanlangendonk surged past in the next 2 miles to hit the 5K timing mat in 20:57, two seconds ahead of Williams. But Williams found the strength to come back and run the 2nd half of the race 7 seconds faster than Vanlangendonk, to re-establish the 5 second gap. In the end it was Williams 2nd across the line in 41:56 with Vanlangendonk 3rd in 42:01. Unlike on the men’s side, which had a number of National Class performances, the only one on the Women’s side was turned in by Rhines. Naturally hers was not just National Class but World Class as her 33:21 age graded at 94.2%. The oldest woman to finish was 87 year old Carmen Caldas, New Orleans LA, who finished 5th of seven W80+ entrants in 2:07:06. The oldest woman to win a medal was 83 year old Rita Sadowski, Newton KS, who captured the W80+ gold medal in 1:27:38. Congratulations to both of them for some impressive running! Congratulations to all of these Masters Runners for an impressive start to the 2016 Road Racing Season! Oldest Woman to Finish: Carmen Caldas New Orleans LA 87 2:07:06 5th of 7. *Foreign nationals who won a race or took an age group medal are largely ignored in this coverage which focuses on US Masters Athletes.